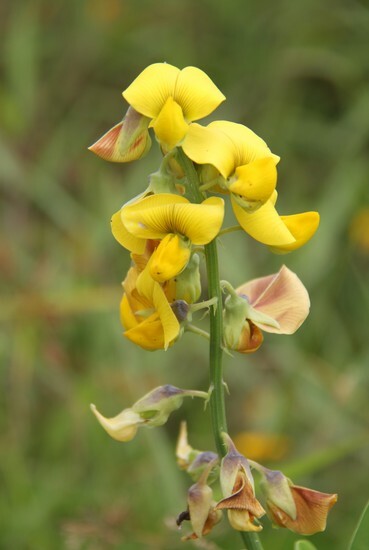 A summer annual weed with relatively showy yellow flowers and distinctive seedpods. 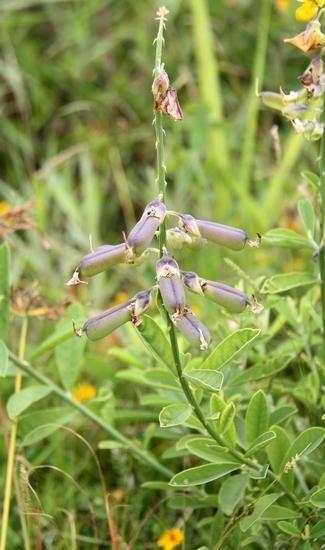 Showy crotalaria is primarily a weed of agronomic crops and may be found from Virginia to Missouri and southward. 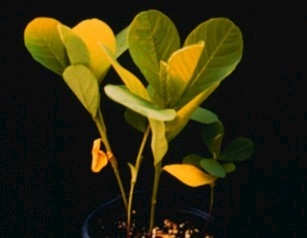 Stems below the cotyledons (hypocotyls) become maroon with age and are covered with short hairs that lie flat against the hypocotyls (appressed). 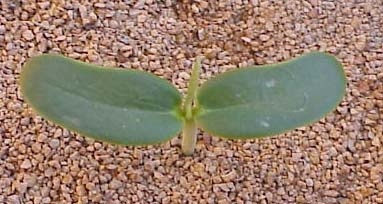 Cotyledons are bean-shaped, thick, dark green above and light green below. First true leaves are alternate and widest at the apex and tapering to the base. Leaves are without hairs on the upper surface and covered with appressed hairs on the lower surface. Alternate, approximately 2 to 6 inches long, widest at the apex and tapering to the base. Leaves are without hairs on the upper surface and covered with appressed hairs on the lower surface. 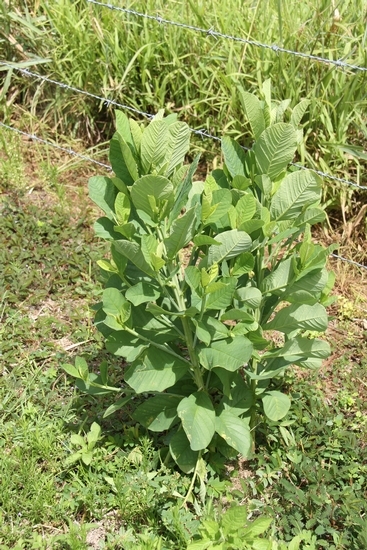 Leaves occur on short petioles. 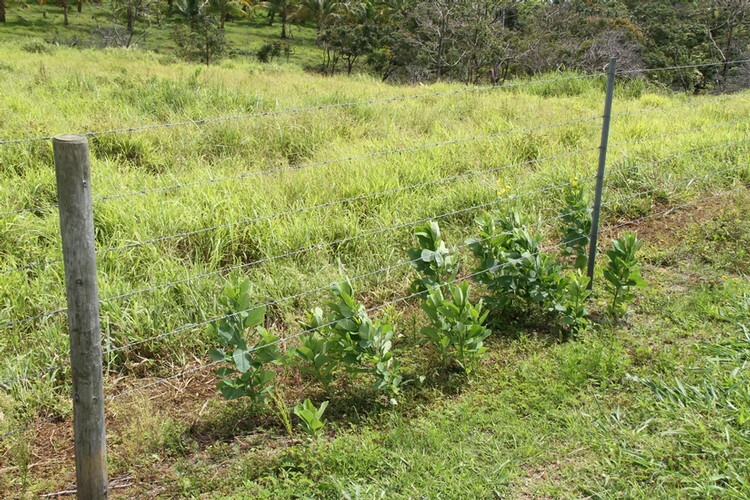 Stipules also occur at the base of the petioles but usually persist only for a short time. Erect, reaching 6 1/2 feet in height, stout, and green or purplish in color. Stems become waxy and somewhat angled with age. Individual flowers occur on elongated inflorescences (racemes) and are stalked from a central axis, large, showy, and bright yellow in color. Flower stalks have a distinctive bract at their base that is approximately 7 to 12 mm long and 5 to 9 mm wide. 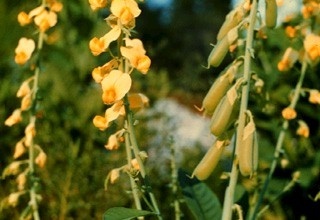 A legume that is 1 to 2 inches in length and takes on the appearance of an inflated cylindrical pod. Fruit turn brown to black when mature and the seed within the fruit often become unattached resulting in a "rattlebox" sound when shaken. Leaves that are widest at the apex and taper to the base. 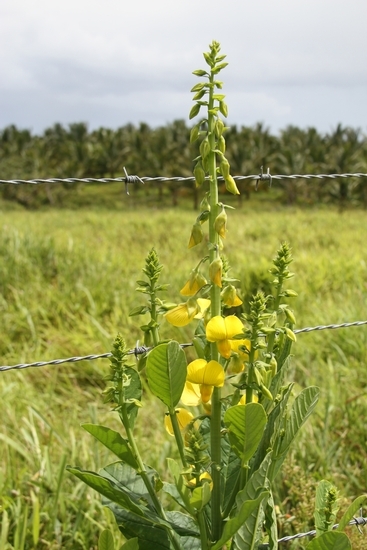 Also the bright yellow flowers and distinctive seedpods help to distinguish this weed from most others.